The thought of narrowboat ownership conjures images of long and lazy days gently cruising the tranquil connected waterways of the English and Welsh canal and river network, stopping when and where you want to enjoy a day or more sitting quietly on the towpath or river bank in the warm summer sun, enjoying a delicious boat-cooked meal and a glass or two of wine. It’s true, narrowboat ownership can lead to an idyllic lifestyle but, contrary to many aspiring narrowboat owners’ expectations, it’s not a particularly cheap one. The ongoing costs are comparable to running a small family home. There are a huge number of narrowboats for sale at any one time with over 1,000 on the popular Apolloduck web site alone. The choice and price range is both staggering and bewildering. A narrowboat can cost as little as £10,000 for a project craft to more than £150,000 for new boat built to your own specification. The initial purchase price isn’t all you have to consider when buying a boat. Getting an out of water survey to check the integrity of the hull is absolutely essential, as is ensuring that you keep something in reserve for the inevitable post purchase remedial work. A narrowboat may have been on brokerage for a year or more. Battery banks often need replacing and there’s often rust to treat and paint to touch up, especially on boats at the lower end of the market. All of the on board equipment needs checking before the sale is completed as most boats are sold “as seen”. Once you’ve parted with a substantial amount of cash for the boat, you’ll have to part with much more to keep your boat both legal and in good condition. Your largest ongoing expense is likely to be your mooring fees. Unless you plan to continuously cruise the canal network, ensuring that you move on at least every fourteen days, you are obliged by the Canal & River Trust’s licensing regulations to declare a home mooring, somewhere you keep your boat when you aren’t cruising. A marina mooring will cost you in excess of £2,000 a year in most of the country but the cost will rise the closer you are to London where you can pay up to £10,000 every year for the pleasure of parking your boat. Your next largest expense will be your license. Your narrowboat license is determined by the length of your boat and ranges from £700 a year for a 40′ boat up to £1,000 for the longest 70′ narrowboats on the canal network. In addition to your license, you will also need a BSS certificate, a boat MOT and insurance. 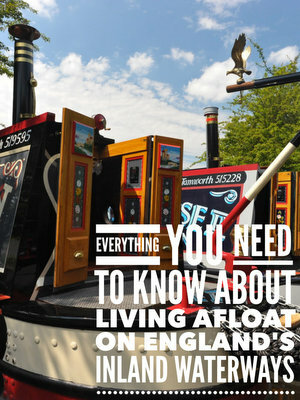 Although there are one or two wooden narrowboats on the waterways, most have steel hulls and steel cabins. The steel needs to be protected to prevent rust which means that every two or three years you have to take your boat out of the water to paint the hull and every seven to ten years have the cabin professionally painted if you aren’t going to do the work yourself. Professional cabin painting can cost in excess of £100 per foot. Narrowboats need regular maintenance. In addition to regular engine servicing, you’ll find that normal household items need far more care than their dry land equivalent as your floating home is often subject to intense vibration and regular knocks and shakes from content with canal and river banks and concrete or brick lock walls. Utilities on board can be costly, especially off grid electrical generation. Most boats use propane for cooking which is reasonably economical but beware if your new boat only has gas powered central heating. Propane gas is one of the most expensive ways to keep your boat warm and the gas produces a wet heat which aids condensation. If you are considering living on board, a solid fuel stove is the most reliable and one of the most economical forms of heating for your boat. You’ll probably want to use your boat to cruise the network rather than keep it in one spot as a static floating home. Your diesel engine will probably consume somewhere between one and one and a half litres per hour so, at an average cruising speed of just over two miles an hour your boat will use as much diesel as a large four wheel drive car. Unlike the car though, you can live in your boat in comfort. Many boat owners will tell you, only partly in jest, that B.O.A.T. is an acronym. It stands for Bring Out Another Thousand. Living afloat can be an enormously enjoyable but not particularly cheap lifestyle but buying a narrowboat for recreational cruising is a very expensive hobby. Paul Smith has been living in his own floating home for the last five years, moored in the idyllic setting of Calcutt Boats’ Meadows marina where he has worked at the marina by day and blogged about life afloat by night. He’s produced a free guide for anyone thinking of buying a narrowboat, particularly those buying one with a view to living afloat full time. You can download the guide here.